Summary: One of the easiest ways to pack nutrition into a meal is by making a smoothie, especially if you need something that’s quick or can be taken out the door with you. To create a smoothie that’s effort free, and that will keep you energized and nourished for a few hours until it’s time to eat again, opt for one with readily available ingredients that are also powerfully nutritious. One of the easiest ways to pack nutrition into a meal is by making a smoothie, especially if you need something that’s quick or can be taken out the door with you. To create a smoothie that’s effort free, and that will keep you energized and nourished for a few hours until it’s time to eat again, opt for one with readily available ingredients that are also powerfully nutritious. Make a smoothie from fresh produce from your farmer’s market, health food store, or backyard garden. Take care that it has adequate amounts of protein, complex carbohydrates, and fiber to sustain your energy and make sure you’re getting all the fuel your body needs. We suggest you make this Glorious and Green smoothie to fill you up, and to please your taste buds, whether you’re strapped for time or have all the time in the word. Combine all ingredients in a high speed blender. Pout into a tall glass and enjoy! For variations of this smoothie, you can add in 1 tablespoon of cacao nibs or 1 tablespoon of cacao powder. 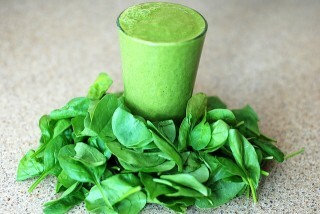 Wondering why we recommend organic almonds and organic spinach for this Green and Glorious Smoothie? Almonds have a thin skin and they easily soak up toxic pesticides and herbicides that might be sprayed on them. When you purchase organic almonds, you’re assured that their organic certification has required a more healthy approach to growing. Spinach doesn’t have any skin at all, so it’s highly susceptible to retaining dangerous amounts of harmful pesticides and herbicides. Again, with organic certification, you know that your spinach has been grown without the use of conventional pesticides and herbicides. The Environmental Working Group (EWG) has once again, for 2016, placed spinach on its Dirty Dozen list, which is a list of the top 12 produce items that are heavily contaminated with pesticide and herbicide residue.